Have you heard? 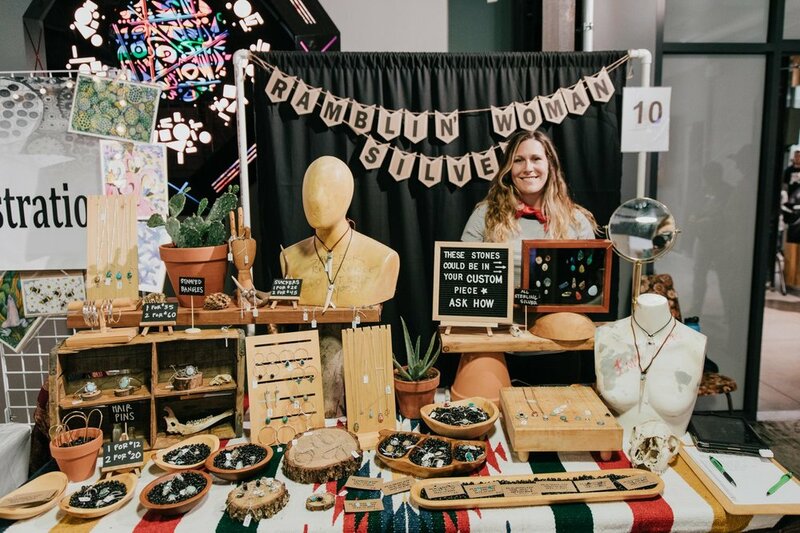 New this Spring, we are partnering with Verlocal for Jackalope Pasadena to provide hands-on workshops and unique activities at the Verlocal Experience Booth within the fair! Verlocal is a perfect fit for us because we both believe in better exposing the local community to handmade makers and artisans. Verlocal takes experiences beyond just individual events by building businesses and connecting them to people looking to discover local classes, events, products and services! Verlocal.com is a platform for artists, artisans, craftsmen and domain experts to offer unique classes, events, services and sell handmade products to a community of passion seekers. Through Verlocal, Verlocal Business users can set up an online Verlocal Storefront and sell their experiences and products to hundreds of thousands of local customers. Businesses will also gain access to online tools like an online booking system, customer messaging tool and more to help them launch and manage their passion-based business efficiently. Whether you want to host a workshop at the upcoming Jackalope Pasadena event, or simply want to sell your products through Verlocal, the first step is creating a Verlocal Business Account. REASON 1 - Get a free digital online shop to sell anything, even workshops! A Verlocal Business Account provides you with a free digital online shop that allows you to sell classes, workshops, events, services and products. Your offerings will also be listed in their localized marketplace for unique experiences and products. REASON 2 - Join hundreds of other users, you will gain access to a suite of online software tools to maximize your craft business processes. Check them out at www.verlocal.com/pro. REASON 3 - You can supercharge your craft fair experience through the social features of your Verlocal Account. People can find your offerings easily through the Verlocal iOS App or Mobile Website. And through your account, people can easily follow your store in one scan/click and store you in their wish-list so they can revisit your store after the craft fair. Any Verlocal business who is at Jackalope Pasadena will have a QR Code for shoppers to scan! REASON 4 - If you are a Jackalope Pasadena vendor, you will benefit from their direct marketing promotions to get more sales from Jackalope Craft Fair Visitors. $5 Free Verlocal Credits will be given to new sign-ups and iOS app download users at Jackalope Pasadena. If you have a Verlocal Business Account, these users can spend those credits in your store or for a workshop that you may be hosting at the fair! Be Featured Prominently in their marketing campaign leading up to Jackalope Pasadena. They will work with you on a branded content article that will be shared across their social media channels and on their Landing Page website. REASON 5 - Also for Jackalope Pasadena Vendors, be part of a Fair-Wide Giveaway Scavenger Hunt! Get customers to visit your store like Pokemon GO! When they scan a unique QR code at your store, they win a raffle ticket which they can use to enter in their online raffle exclusive where they can win free gifts and discounts. Verlocal X Jackalope Pasadena Landing Page will feature all Verlocal Stores participating in the fair. Visitors can easily go to this landing page to find stores and follow those they like and they can make purchases directly on this page. Verlocal will also write a content article about you that will be shared across all their social media channels. At the event itself, they will also promote your brands in their Experience Booth and also display you at their Verlocal Booth. As you can see there are many reasons why Verlocal is such a powerful tool! We are very excited to partner with them and we hope many of you see the value in what they have to offer, whether you are a Jackalope Pasadena vendor or not. Interested in hosting a workshop at Jackalope Pasadena this Spring? Click Below! With holiday season prep underway, and shows upon shows all just around the corner, we thought it would be a great time to share some tips on how to make the best at any event. 6) "Do a practice set up of your booth ahead of the show. Makes the best use of your space, and saves so much time at setup." 10) "Keep energy high! Remember good healthy snacks & water. It will keep your mind clear and a smile on your face. A beautiful booth wont help if you are crabby or sluggish.